This was a sweet and heartfelt story that I really enjoyed! The two boys meet by chance after being in a very small town with not many choices available in the gay/bi population – the worst Grindr dashboard ever! Rusty is a music teacher at the high school and he's a total hot hipster. Niles is the shy-to-the-extreme museum nerd who's very socially awkward. Niles is completely clueless, but Rusty has enough confidence for both the men. The chemistry is off the charts when Rusty goes after the shy and sweet Niles. The quiet ones are always the most fun! Niles had deep self-esteem issues and thinks he's not worthy of love or the attention of such a handsome and confident man as Rusty. He's a runner, relationships get rough and Niles is long gone. The two have some issues working through Niles' need to keep himself walled off from love. Throw in "The Todd" who is Rusty's ex-boyfriend and current coworker, who also happens to be the town's gay golden boy (everyone loves Todd), and you have yourself some good relationship tension, some "you didn't mention you work with your ex" drama, some heartbreaking breakups, and a nice get back together! All in all, a well told story! I really couldn't get into this book. I put it down several times and came back to it, but still nothing. It was slow, boring, and a bunch of drama that just drove me nuts. The book was soooo wordy that I skimmed a lot and it was still boring. Niles was annoying, and he treated Rusty like crap. Most of the book they weren't together, and I just found myself not caring how the story ended – I just wanted it to end. Definitely not for me, but I am sure others will love it. This book is super sweet, fun, and an easy read. I did feel that they acted somewhat younger than they were. In Niles' case that made complete sense, as he was pretty sheltered (although he had been away to college), but for Rusty, it seemed a bit much at times. Whilst I got that he needed to be cautious and he wanted to keep everyone happy, it was somewhat drawn out. I liked the premise, and some of the scenes were funny, especially when Todd and Vic were around, but overall, I was frustrated by the men. I don't have anything against crying – I do it all too often, but it became too repetitive and had so many meanings that it became meaningless for me. I admired Vic's patience, a lot. 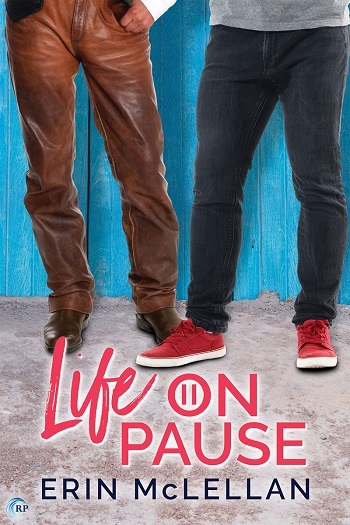 Reviewers on the Wicked Reads Review Team were provided a free copy of Life on Pause by Erin McLellan to read and review.